Produktinformationen "Korean Culture Series 9 - Buddhist Architecture of Korea"
The easiest way to learn about Korea’s Buddhist culture is to visit the temples where the traditional practice of asceticism is still carried on today. People no longer live in other examples of traditional architecture, such as palaces and Confucian schools and academies; but in temples the monks and nuns eat, sleep and live in the traditional way, wearing traditional robes. Of all the countries in East Asia that share Buddhist culture, only in Korea is the traditional practice of asceticism strongly maintained. This book aims to discuss the part architecture plays in this traditional temple culture. While temple life and the practice of asceticism are integral to each other, this books attempts to isolate the architecture as a physical entity. Though several books taking a similar approach have been published in Korea, this one has been written with foreign readers in mind. Prof. Kim Sung-woo was born in Seoul in 1950. After graduating from the department of architecture at Yonsei University he went to the United States where he received his master’s degree in urban design from the University of Pennsylvania. He went on to receive his Ph.D. in Architecture and art history at the University of Michigan, writing his dissertation on Korean Buddhist architecture. Since returning to Korea he has served as a professor at Yonsei University, mainly lecturing on architectural history and theory. 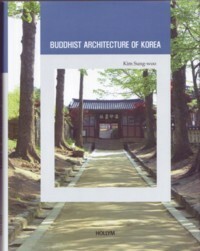 Prof. Kim has published many papers on the subject of architectural history and theory as well as the research report Seongju Hangae Maeul (Hangae Village, Seongju), and the books Songgwangsa (Songgwangsa Temple), Hanguk Geonchuksa (History of Korean Architecture, co-author) and Wonya, the Korean translation of a Chinese book on landscape architecture. Prof. Kim’s research is focused on theorizing the spirit of the traditional architecture of Korea and other Asian countries form the perspective of cultural philosophy and thereby contributing to the future development of architecture. Weiterführende Links zu "Korean Culture Series 9 - Buddhist Architecture of Korea"
Unser Kommentar zu "Korean Culture Series 9 - Buddhist Architecture of Korea"
Kundenbewertungen für "Korean Culture Series 9 - Buddhist Architecture of Korea"